The Number of Joplin’s Historic Buildings Decreased By One: Rains Building Lost to Fire. 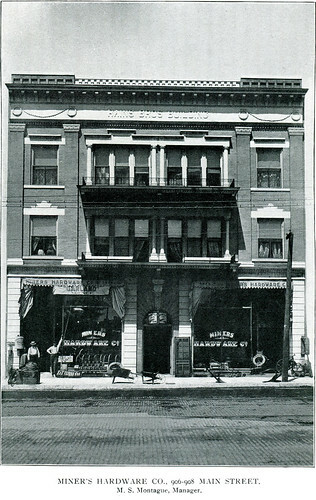 The Rains Building circa 1902. The next time you cruise down Joplin’s Main Street, you may notice that yet another of the city’s historic buildings has been lost. The Rains Building, located at 906-908 South Main Street, burned on Thursday night. The building, attributed to one of Joplin’s most prominent and prolific architects, August C. Michaelis, is a tragic loss. Built in the Renaissance Revival style at the turn-of-the century for brothers Charles and George Rains, it brought an understated architectural elegance to the block. Like many buildings along Joplin’s Main Street, it was home to several different businesses including the Miner’s Hardware Company, the Bullard-Bell Company, and the Roosevelt Hotel. By the 1970s, only the first floor was in use as an antiques shop. When the building was nominated for the National Register of Historic Places in 1991, it was noted that little, if any, alterations had marred Rains Brothers Building original design over the years, unlike many other buildings. Image via Wikipedia.org, Rains Building circa summer 2010. Here is a link to the Joplin Globe‘s coverage of the fire and here is a link to the National Register of Historic Places, a source for more detailed information on the building.